THE ADVERTISING WATCHDOG has upheld a complaint against Harvey Norman over a radio ad targeted at Leaving Cert students. The advertisement for the electrical and computing appliance shop stated: “Would you like a free coffee? How about free doughnuts? What about 10% off a laptop or Apple Mac. “Well, if you’re collecting your Leaving Cert results you’re in luck. Because at Harvey Norman we’re gonna give you all three tomorrow. A person complained because they felt the ad was socially irresponsible. 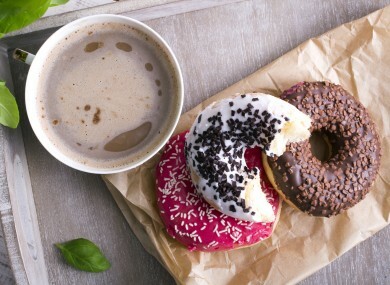 They said the reference to free coffee and doughnuts helping with a sore head was about Leaving Certificate students drinking on their results night. The person felt this was inappropriate as many Leaving Certificate students are under the age 18 and therefore not supposed to purchase or drink alcohol. Harvey Norman said that their intention was to allow students to “look at technology products which were available to them as they moved onto the next stage of their education or started their working lives”. They said that at no stage in the advertisement did they mention alcohol or encourage the consumption of alcohol, and they were simply offering coffee and doughnuts as part of a promotional deal. The company also stated that the word ‘sorehead’ in the Collins English Dictionary refers to a disgruntled person. The Advertising Standards Authority for Ireland’s (ASAI) committee noted this, but said the wording “…that will help with a sore head, so enjoy tonight” could make a listener assume it was referencing “over-indulgence associated with celebrations after getting Leaving Certificate results”. When explaining its decision to uphold the complaint, the committee said it did not consider it to be socially responsible to make light of over-indulgence, particularly when a number of those involved were likely to be under the legal drinking age. The committee ruled that the advertisement should not reappear in its current form. Other complaints were upheld against 12 other advertisements, including ones from Kerry Group PLC, Paddy Power and Pulse Venue in Letterkenny which promoted a ‘shag a ginger’ night. Email “Harvey Norman ad that referenced Leaving Cert students with 'sore heads' banned ”. Feedback on “Harvey Norman ad that referenced Leaving Cert students with 'sore heads' banned ”.